At Newington College we believe that technology plays an integral role in helping students learn. Dr Ruben Peutendura (SAMR), Punya Mishra and Matthew J Koehler (TPACK) see the value of using technology to augment, modify and even redefine learning activities, making possible new forms of engagement, interaction and growth. At Newington, we believe technology plays an integral role in our boys’ learning. In some cases, this involves learning about how technology works in robotics and app development classes. At other times, it is using technology to complete a classroom activity. Increasingly our use of technology is across all learning areas. Through the introduction of online tools and innovative applications, our teachers use technology to enrich our students learning, leaving them with skills, tools and ways of thinking that will be beneficial well beyond their schooling. 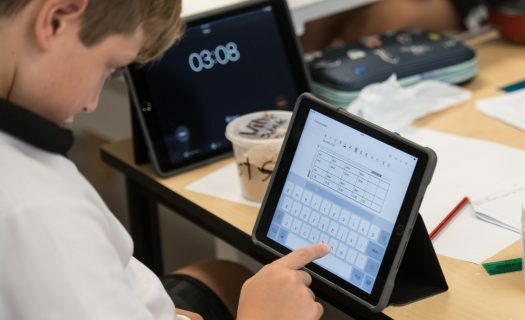 Technology allows the boys to CREATE, CONNECT, ORGANISE, and PERSONALISE their learning. Newington has made some recent changes to its device program to adapt to the new innovations in learning technology and in response to the needs of our boys and teachers. Boys in K-4 have access at the College to one on one iPads in their classroom for engaging with learning applications. This helps them to show and interact with what they are learning. Students in Years 5 & 6 are provided with a Newington owned iPad Air 2 with 64GB of storage and WI-FI only capability. This device will be managed by Newington ICT and your son will be provided with a special school Apple ID managed through the Apple School Manager Program. Apple School Manager and Classroom App boast many great features and new possibilities for using iPads in the classroom. As well as the practical management and administrative benefits, Apple School Manager is expected to enhance the learning experience for both students and teachers in the classroom and eliminates a number of common issues and concerns that parents can experience when managing iPads at home. An additional bonus is a feature that allows ICT to take away the headache for parents when setting up iPads ready for use at school.